A meter to measure PE power is very useful. This circuit using a LED Bar graph can be built in two forms and can set-up for either 1 kW or 150 Watts full scale. Als je veel met antennes bezig bent zoals op velddagen, vakanties en niet te vergeten thuis, is het prettig een meetinstrument te hebben om te zien wat je aan het doen bent. 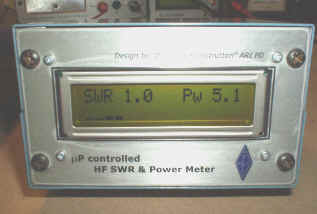 This project describes a digital, totally automatic, version of the classic SWR meter, capable of displaying both the SWR and P.E.P. power values, with a bar graph on the second line tracking the instantaneous power. The bridge shown is popular with QRPers. There is no setting up to do and the circuit need not be laid out symetrically as with other designs. This simple SWR bridge uses a superbright LED instead of a meter and was described by G0WQR in Sprat 93. He found the LED is fully illuminated with less than 1 watt output and extinguishes when minimum VSWR is achieved. Following the purchase of a Yaesu FT817 rig it was decided to make an SWR meter to match a Bremi BRL15 Tuner that had already been modified. I started to experiment with HF FET amplifier. Amplifier project is not yet ready but this SWR meter diversified off from it. Amplifier controller is going to include this SWR meter and other bells & whistles. 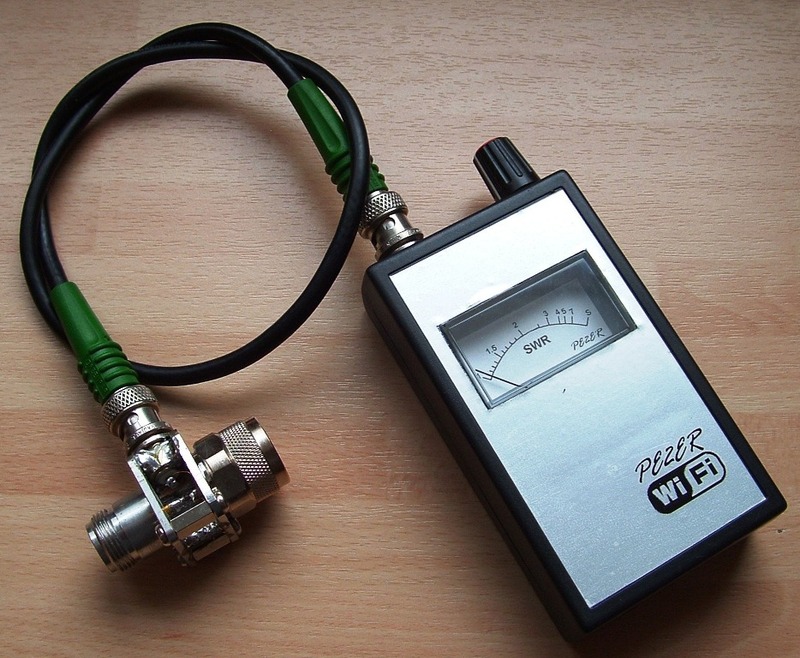 This instrument can be used and calibrated from 1 kHz and up to 500 MHz. It is possible to measure power relative all the way up to 900Mhz. A software routine can calibrate the 0dBm point at 5 different frequencies to make this instrument accurate within 0.5dBm !! Inmiddels heb ik ook een HF swrbrug gemaakt die tot 50MHz bruikbaar is. De print past in een klein blikken of aluminium doosje, en kan als Remote-sensor met een 3 aderig snoer ergens in de Shack een plaatsje vinden. Bij het bouwen van antennes voor de Wifi band (zoals de 8dBi omni), ontstaat al snel de behoefte om deze antennes op een eenvoudig manier te kunnen testen. Een staande golf (SWR) meter voor de 2,4GHz band is echter niet eenvoudig te krijgen. The circuit for the VSWR Meter is by no means original, but it is probably one of the most useful accessories that I've made for my LF station. Constructed from parts collected at Radio Rallies, the total cost was £8 ($12). I thought it would be a good idea to put in a few schematics for accessories that I've found useful here. One of these is an antenna bridge for QRP applications. I know of a few "thru-line" or wattmeter styles, but most SWR meters can't really go down to the low powers in QRP work. Dit is een eenvouduge relatieve powermeter tot maximaal 1 Watt. De weerstanden en diode en condensator op het chassiedeel solderen. 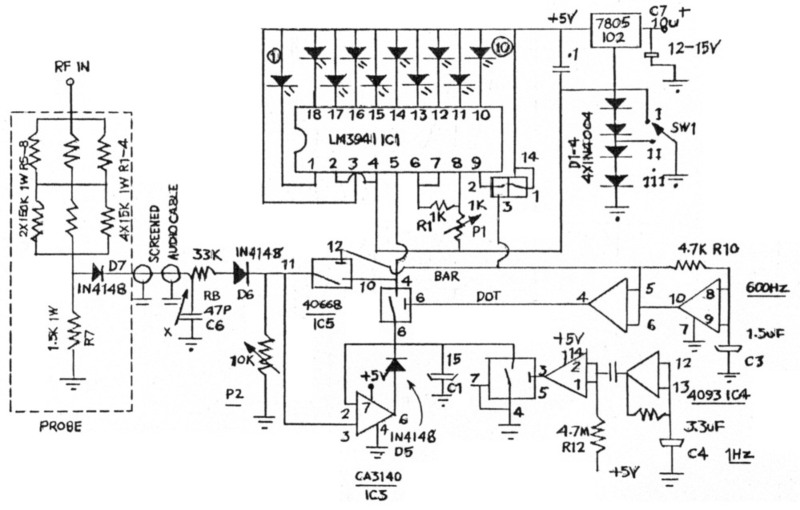 The above schematic is of my QRP power meter and dummy (50 Ohm) load combination. The 50 Ohm load consist of resistors R2 through R5. The four 200 Ohm resistors in parallel combine to make 50 Ohms. A lot of troubles occur, when I make expedition on the local hill. 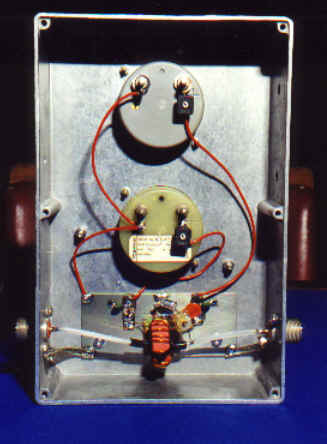 For example miss connection between transceiver and the antenna occurs sometimes. In order to avoid these troubles, I will recommend you to use the SWR-meter in every time of your QSO. Everyone involved with radio transmitters needs some instruments to assess basic antenna functionality. Among these instruments, the best-known and most-used one is the Standing Wave Ratio meter.